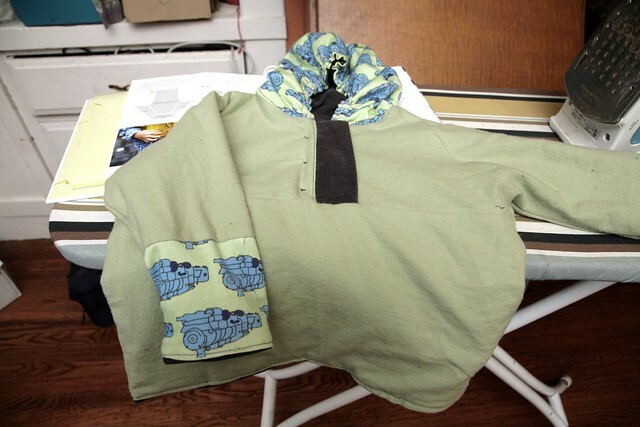 Inder Loves Folk Art: Luka Hoodie "Reveal." I finished the Luka Hoodie last night, and I am so pleased with it. It's probably the nicest thing I've made for Joe to date. Unfortunately, in a trend that does not appear to be improving, the photo shoot this morning did not go well. Me: Joe, let's try on your new hoodie! It has blue trains! Joe: No! No boo fway! Me: Joe, let's just try it on real quick, okay? Mommy made you a nice warm hoodie! 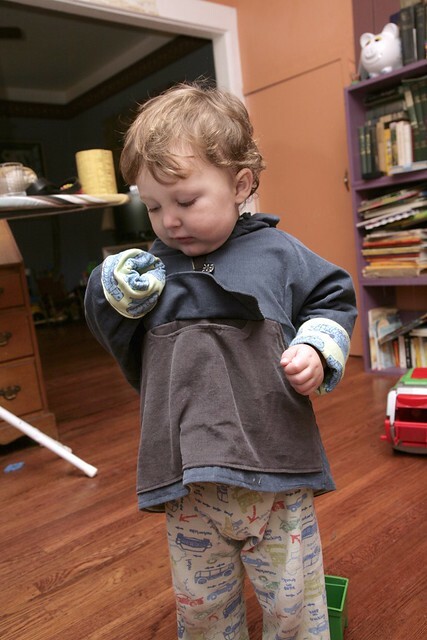 Me: Joe, can you just put it on for a minute to see if it fits and let mama take a picture? Joe: No boo fway! No fway! No! No! What happened to my hand? Me: Let's roll that sleeve up a bit more. Joe: No! Off! Off! Shirt off! OFF! He's trying to take it "off." Me: Please, Joe? Please? Just let mama take a picture? Well, shoot. This is not going well. Me (looking at that sad face): Sigh. Okay, we'll take it off. Sorry, Joe. 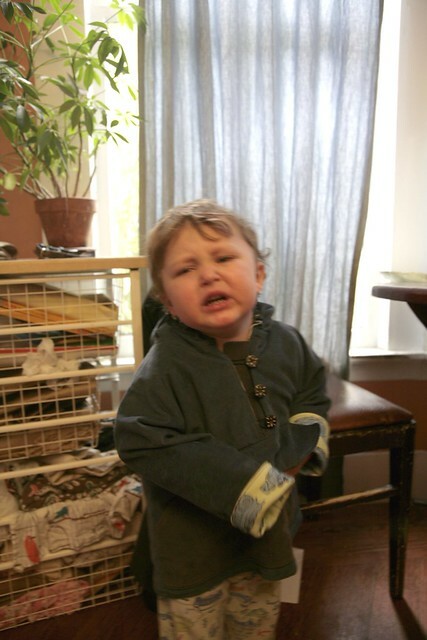 So, okay, apparently I am such a mean mother that not only do I spend days sewing warm, cozy, and practical clothing for my child, with his interests (blue trains!) specifically in mind, but I then make him try them on, and then I try to take photos of him. I mean, what kind of monster? Blarg. Since my model was so uncooperative, you'll have to make do with a few detail shots on my ironing board. I've been holding onto these great buttons for a while - I had only three! Perfect! There is a hand-warming pocket and also a "secret" pocket under the flap. You'd think a child would love this, right? And for you real sewing geeks, here's the inside, which I'm also really proud of. 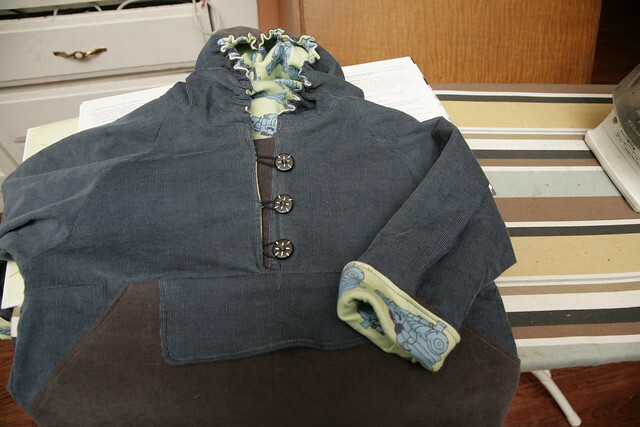 This gives a good view of how I lined it (to showcase but conserve blue trains - the rest is sage-green flannel) as well as the little placket that I added behind the buttons (not in the pattern) to help keep drafts out. This pattern, which came from Sewing For Boys, takes some time and care, but the final results are absolutely smashing, and I could not be more pleased. The pattern instructions are probably perfect for an intermediate seamstress, and I would warn beginners that there is not much hand-holding. Readers are expected to understand technical sewing language. But in my opinion, this is also the great strength of this book: While I love an easy project as much as the next person, I also love how many satisfyingly complex patterns are included in this guide. It's the more challenging patterns in this book that really kick the genre of "sewing book with patterns" up a notch or two. I should note that I was not able to finish the hoodie hem and sleeves the way the book suggests. It's a long story, but basically, I had made a few changes and taken some steps earlier in the sewing that precluded the origami-like finishing process. When I got to that point of the pattern, I was like, "Whoa! Complicated, but total genius! Too bad it's too late for me to do that!" So then I finished it in a more standard way, just folding everything under, pressing, and top-stitching. Ah, well. Next time, I suppose. The size (2/3) seems perfect, with plenty of room to grow (I added length to the sleeves for the cuffs, so don't be fooled by the super long sleeves). It goes up to size 6/7, I think! Basically, it took absolutely forever and a day to make, and I love it. The million dollar question: Forget loving it, will Joe even wear it? Well, we'll see, but I think so. I think there's something about the whole trying-to-photograph-him-for-the-blog process that just makes Joe contrary. Too much pressure. So tempting to assert his independence by saying "no no no!" I bet if I put this on him and let him run around a park or something, rather than asking him to pose for photos, things would go much better. 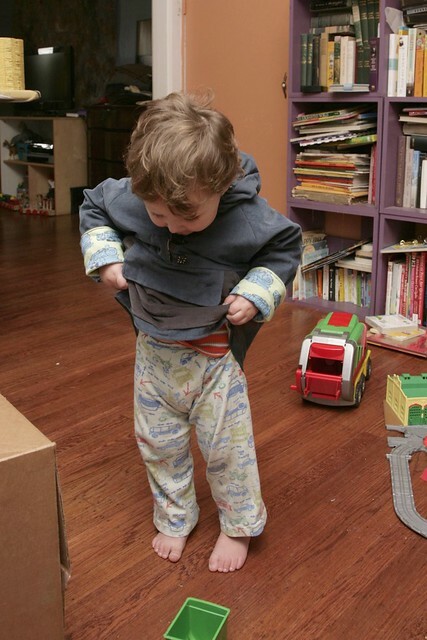 Toddlers can be fickle creatures. Poor kid. I hope I haven't scarred him for life by sewing him an awesome hoodie and then hoping he will wear it! Oh, you are such a cruel mother. NO boo fway! It's awesome. I sincerely appreciate every detail - adding inside placket to exclude draughts? Brilliant! Given time and the development of a bit of little-kid-vanity Joe may learn to ham it up for the camera. Does he like to look at the image on screen after you take a shot? (I get 'can I see? can I see?') And I am hopeful that in his own good time he will adore boo fway hoodie! I already commented on your Flickr picture, but I do really love this jacket. The pattern has been calling to me from the book every time I flip through it, but I am always intimidated by the amount of supplies I need. You did a great job. I think he will definitely wear it when the camera isn't there. My toddler is going through the same stage of defiantly flipping out if she knows I'm just dressing her for a fitting or pictures. Sigh. They do have a special way of infuriating us don't they? Hey everyone! Thank you so much for the nice words! Yes, he wore it last night (it was chilly, so I think he could appreciate it) without complaint, and it looked CUTE. I think I have to learn to be more patient about photo shoots. If I can get him out of the house and having fun, he'll wear ANYTHING. There's something about a "photo shoot" that is not working. Although I have to say, he is SO CUTE when he is mad/sad, it kills me! Today Joe and I were looking at these photos and he said, "Joe sad!" And I was like, yeah, mama was kind of sad too, Joe. Hehe. 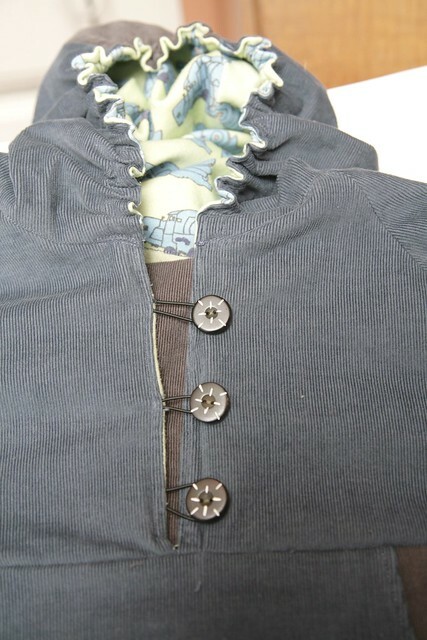 The details on this hoodie are amazing...inside and out! Oh my goodness. That's exactly the same conversation I had with my toddler not once but twice when I tried to get him to wear the Henry shirt I made him. If you want to feel better by comparison look at this http://annanicsblog.blogspot.com/2012/06/henry-shirt.html. I just felt awful! I actually cropped out his face in some of the pics (something I never do) because it was that bad. I love your jacket, though. I'm especially intrigued by the placket. I want to make one of these soon and I'd love to do something like that. Good job and I hope he decides to like it. My guy won't wear jackets right now either so I feel your pain. Hopefully he's over it before winter haha!